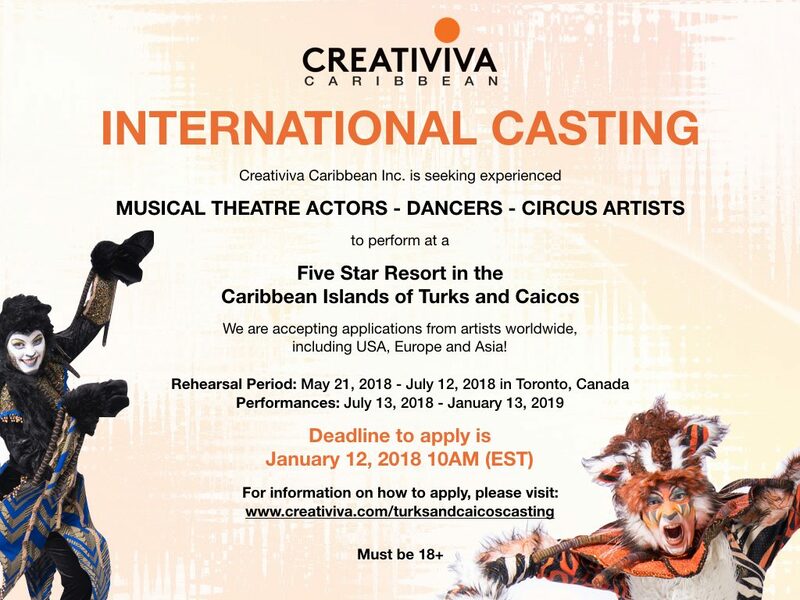 Creativiva Caribbean Inc. is proud to offer another opportunity to perform at a Five Star Resort in the Caribbean Islands of Turks and Caicos and live on one of the world’s most beautiful beaches for 6 months. We are once again accepting applications from artists worldwide – including USA, Europe and Asia! All candidates must be available for the full duration of the contract. All candidates must have a valid passport to travel internationally. All candidates must be 18+. This is a paid, non-union contract. Please read carefully and submit all required documents via email (below). 3. Link(s) to your Show Reels (do not send video attachments); please include samples of your vocal abilities, stage experience and dance experience (musical theatre experience). Do not send film reels. 3. Link(s) to your Demo Reel (do not send video attachments); including multi genre styles, demonstrating your technical abilities. 3. Link(s) to your Demo Reel (do not send video attachments); please show your acts in full. You must have a minimum of 2 acts. Please note in your email where you saw this submission. Only complete applications (CV, headshot, photos, proper links) will be considered. We thank everyone for their interest, but only pre-selected candidates will be contacted for our interview process. Interviews will be conducted via Skype. *Pre-selected actor candidates may be asked to prepare a song and monologue. Performers will be paid a weekly fee for the rehearsals in Toronto. During the rehearsal period, selected candidates must be available for all photo shoots, video shoots, meetings and any promotional events while in Toronto, inclusive in the performers rehearsal fee. Performance fee will be paid monthly for performances and will be determined based on skill set and role of the performer in the productions. Additionally, performers must take part in any promotional activities and social events as requested by the resort (non-performance), inclusive in the performance fee. Performers must obtain their own travel insurance for rehearsal period in Canada at their own expense. A health insurance plan will be provided and the cost will be split amongst 3 parties: the resort, Creativiva Caribbean Inc. and the performer. Each party will contribute to the insurance plan monthly in the following breakdown: US$170/month divided between the resort (US$44.43/month), Creativiva Caribbean Inc. (US$56.67/month) and Performer (US$68.90/month, deducted from monthly salary). Producer covers the fee of a visa application or an Electronic Travel Authorization (eTA) to rehearse in Canada (depending on country of residence). Performer provides at their own expense all required documentation to obtain a Canadian Visa, if required (exact requirements vary based on country of residence). Creativiva Caribbean Inc. covers the fee of a work permit application and handles the process to attain work permit for Turks and Caicos Islands. 1. Police Record valid within 6 months (in English or with certified translation to English). 2. Six (6) Passport Pictures (35×45, colour, no seal) – each photo is to be certified by a notary. 3. Copy of Passport (certified by a notary) (in English or with certified translation to English). 5. Relevant Diplomas or Certificates (certified by notary) (in English or with certified translation to English). 6. Medical form with exam and test results (in English or with certified translation to English). 7. Courier delivery of the package from country of residence to resort in Turks and Caicos Islands. Thank you for your interest in Creativiva Caribbean Inc.!